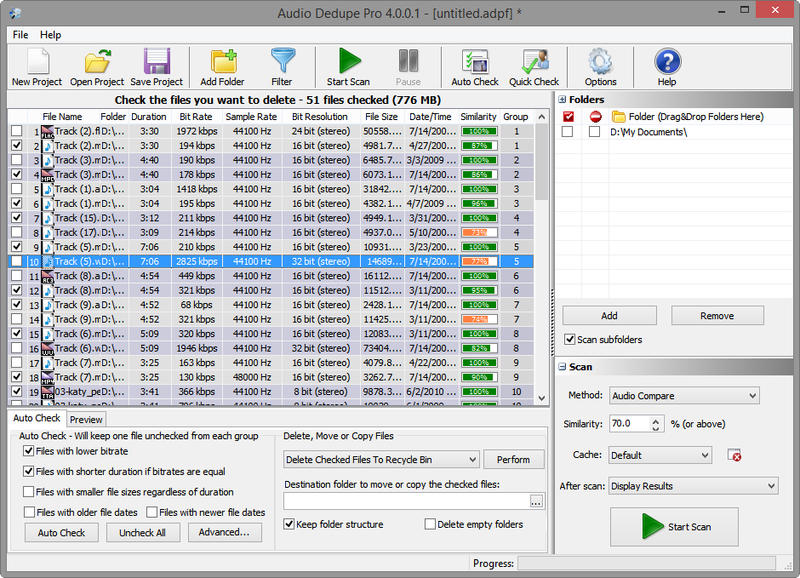 Audio Dedupe is the best tool for finding similar and duplicate songs. It can compare audio files even if they are stored in different audio formats. This is a task that no standard duplicate finder can achieve. If the songs have titles and artists the tool can search those for similarities too. Find what is new in this release below. Fast is actually not very proper description for this optimization as it can be hundreds of times faster on large projects. The code is completely redesigned and provides lighting fast performance. It can load, save or export hundreds of thousands of results in seconds. This option makes it possible to exclude folder names that contain certain characters or words in the name. In past version there was an option to match only file names. Duplicates and scanned files count are displayed above the results grid. Do you have suggestions? Do you miss a feature? Let us know in the comments below. We will be glad to hear from you! This entry was posted in Audio Dedupe and tagged algorithm to find similar songs, alldup, best itunes duplicate remover, delete duplicate songs android, discover new music websites, Duplicate Cleaner, Duplicate File Finder, Duplicate Folder Finder, Duplicate Mp3 Finder, duplicate mp3 finder android, duplicate mp3 finder free download, duplicate mp3 finder mac, duplicate mp3 finder open source, duplicate mp3 finder plus, duplicate music finder mac, duplicate music fixer, Easy Duplicate Finder, find a song that sounds like this, find new music based on what you like, find similar music by mp3, find similar music by song, find similar songs reddit, find similar sounds, find songs with similar beats, how to delete duplicate songs on iphone, how to delete duplicates in itunes 12, how to find good songs, how to find similar songs on spotify, how to mass delete duplicates in itunes, itunes duplicate remover free, itunes duplicate remover windows, itunes remove duplicates from playlist, last fm similar songs, music discovery sites, music recommendations quiz, remove duplicate music files windows 10, remove duplicate music files windows 7, remove duplicate songs from computer, remove duplicate songs from computer free, shazam find similar songs, similar artists search engine, why does itunes duplicate songs on April 1, 2019 by MindGems Support.